One of the easiest ways to prolong swim season is to make pool water more comfortable during colder months. 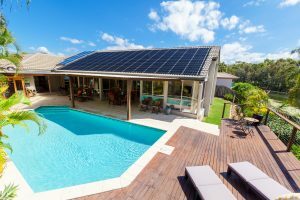 To address this need, solar-heated pools are fast becoming the solution of choice for homeowners, particularly those located in the southeastern United States. In this week’s blog post, we’ll be identifying the most compelling reasons why solar heated pools are superior to other methods of pool heating. Let’s consider the costs – both upfront and ongoing – for electric or gas-burning pool heating solutions. If you’re a homeowner who is considering one of these systems, you’ll be looking at a $1,000-$7,000 upfront equipment and installation cost. Additionally, there is the electric or gas energy consumption cost that accompanies the use of these systems. While this can vary depending on the frequency of use and the size of the pool, you can still expect to pay at least an additional $45-$200 per month in ongoing energy costs. But the costs don’t stop there. For many of these more traditional pool heating systems, there is quarterly maintenance that must be performed. This can often require on-site visits from qualified technicians. Needless to say, these costs add up quickly. Now, let’s turn to solar heated pools and why they’re such a better alternative. With a solar heated pool solution from The LeverEdge, the upfront costs are typically much lower than the electric or gas-burning systems we’ve covered. And, because solar heated pools don’t have as many moving parts as those other systems, they operate for longer periods of time without necessary maintenance. The last and most powerful aspect of solar heated pools is their reliance on the sun for thermal energy. The sun doesn’t have a meter. Its light doesn’t cost a dime. And so, heating your pool with the suns energy doesn’t cost you anything. This takes care of that $45-$200 energy bill we mentioned earlier. Living in geographical regions like ours makes solar heated pools the clearly better choice. So, take advantage of the sun and your spot on the globe, and enjoy more use from your pool. Need even more reasons to go solar and extend the swim season of your pool? Contact The LeverEdge, today. We’ll make sure to answer all of your questions, putting you on the path to a more reliable, more efficient pool heating solution.